Can’t think of another movie that has ever had me so on edge for such a lengthy period of time. Pretty sure my death grip is still imprinted in the theater armrest. 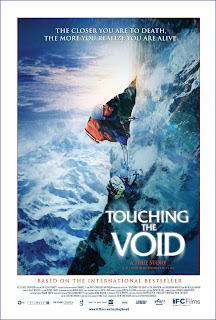 Touching the Void is true story of Joe Simpson and Simon Yates, two experienced mountain climbers that headed to the Peruvian Andes and became the first men to reach the summit of the utterly dominating Siula Grande. So things were looking good for Joe and Simon, then they started to make their way down when Joe went and broke his leg, thus putting Simon in a situation where he had to either let Joe die in order to save his own life or stay with Joe at the risk of his own. Can’t give away what happens next, but being that Joe and Simon are both here to tell their story, you know from the start that they both end up surviving. But trust me, this ruins absolutely nothing. Their account of how they managed to get out alive by the grace of some adrenaline junkie god is a true story you will not believe and stands as one of the most harrowing accounts of human survival I’ve ever come across. Sits itself right on up there with that of the Uruguayan rugby team from Alive. It’s hard to categorize Touching the Void as a documentary because this is far from sitting down and listening to two guys talk about how they almost died for nearly two hours. That’s because director Kevin Macdonald splits this movie up into two genres; the first being the documentary side where Joe and Simon tell their story to the camera, the second being a complete dramatization of the events they’re conveying with real-life actors playing Joe and Simon up in the Andes. For those of you who’ve seen the show I Shouldn’t Be Alive on the Discovery Channel, this formula should sound familiar being that this is the movie that started that formula. For those unfamiliar, it is freakin’ effective and will give you a new outlook on the kind of storytelling that’s possible through “documentaries”. It’s one thing to hear a guy tell the story of how he almost died, it’s another to see someone acting it all out at the same time. Macdonald does one hell of a job transporting his audience into Joe and Simon’s shoes as best he can and once this baby starts getting intense, it does not let up. I saw this in a packed theater in New York when it first came out, and let me tell ya’, you’d have thought the lot of us were in a contest to see who could hold their breath the longest. It was like a communal weight off when the end credits finally rolled and we all walked out in total disbelief, shaking our heads, muttering, “That was effing NUTS!” to ourselves. I’m sure some part of it had to do with me having no idea what kind of experience I was getting myself into, but that explanation is practically irrelevant in relation to every other reason this movie will have you wishing you had Grandma’s oxygen tank handy. Seeing this on a big screen is something I am still really grateful I got the chance to do, but even though that’s out of the question for those of us who haven’t been featured on MTV Cribs, I can only assume that this movie’s desired effect will continue to resound with its audience on a small screen. Regardless, that’s a stupid reason not to see any movie. This is also one of the few instances I can recall where the screen adaptation was better than the book it was based off of, largely due to the fact that you actually get to see Joe and Simon’s story unfold as they recount it. And while Touching the Void has soundly served as the final nail in the coffin for any aspirations I ever had of tackling Everest, I’m pretty sure I’ll be grateful for it in the long run. I’ll just stick to snowboarding for the time being. I feel like a lot of people haven’t heard of this movie, or Joe Simpson and Simon Yates for that matter, but, boy howdy, is theirs a story that deserves to be heard. It’ll have you in a cold sweat throughout, it’ll have you talking like crazy afterwards, and you’ll be wondering how in the hell you’ve never heard of Joe Simpson and Simon Yates before. Great subject matter, a lot of raw emotion that keeps that keeps this from becoming a thrill ride a-la’ Vertical Limit (which was still pretty sweet), and a phenomenal director who knows just how to tell it is a wonderful trifecta you don’t come across very often in movies. Go check this sucker out. It’s much, much better than the weak title makes it out to be. has there been a better use of Boney M in a film ever? dude, I don’t hear that song a lot, but I always think of this movie when i do. good call. Touching the Void (2003) – What the Hell Should I Watch on NETFLIX?